This card came together very quickly. The circular frames were already sitting on my desk - remnants from another card and I hadn't yet used the cupcake stamp set so it seemed time to do so. 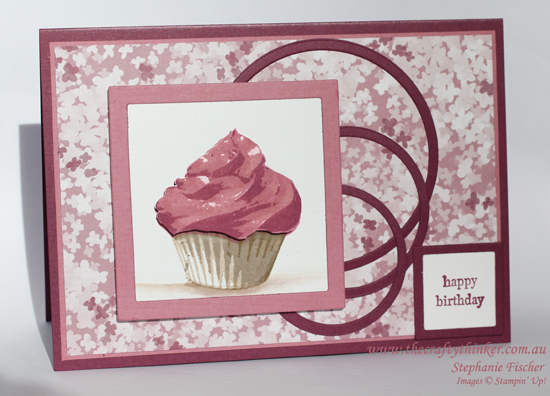 I used the Sweet Sugarplum because it goes so well with the Rich Razzleberry and I wanted to use up those leftover circles. The Blooms & Bliss Designer Series Paper offers the perfect choices to go with those colours. I added some Clear Wink of Stella to the icing. To fit my birthday greeting on a very small square, I used the Teeny Tiny Sentiments set and realigned the sentiment. I covered over the word "birthday" inked the stamp, removed the cover and then stamped the word "happy". Then I cleaned the stamp and repeated the process for the word "birthday", using my Stamp-A-Ma-Jig to line up the words. 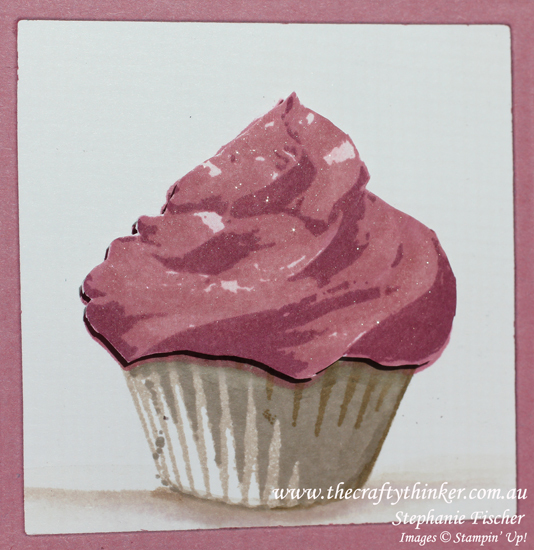 I couldn't help adding a little watercolour shading with Crumb cake to the cupcake image.